Place the 2 slices of pancetta on a paper towel, Place another paper towel on top and press gently. Heat pancetta in a microwave for one minute. Turn over, and cook for an additional minute. Check to see if crispy. If not add another 30 seconds until done. Remove the top paper towel off and set pancetta aside. Heat a small skillet over medium heat for 1 minute. Test with a drop of water to see if it’s hot. Add olive oil and spread it evenly in the skillet. Place scallops in the skillet and brown for at least 3-4 minutes without moving. Turn over and cook for another minute. Turn off heat and add the black truffle butter to the skillet, making sure to coat the scallops well until all the butter has melted. 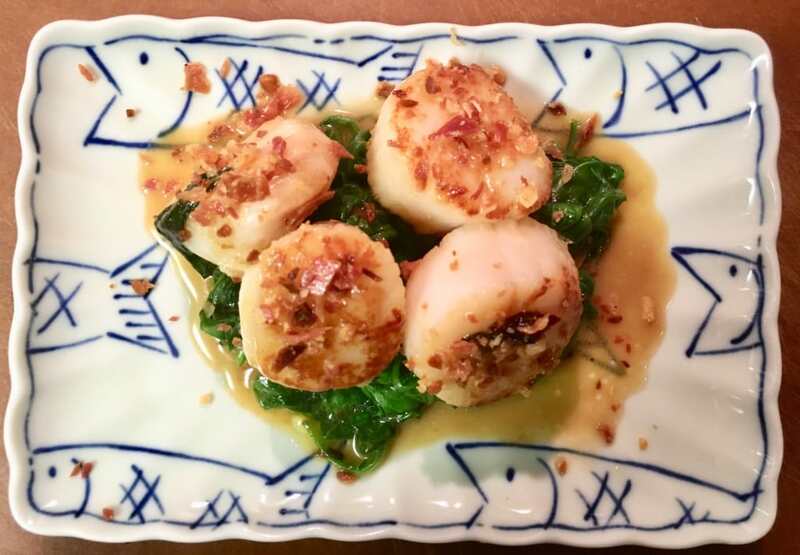 Remove scallops from the skillet and set aside. In the same skillet with the butter, add the spinach and a pinch of salt, and sauté until spinach is wilted. To serve: Place a small mound of spinach on each of two plates. Place two scallops on top of the spinach. Crumble the pancetta into small pieces, sprinkle on top of each dish, and serve immediately.